Acceptable for ISO 14001 certification audit? – All documents required by ISO 14001:2015 revision are included, plus other optional policies and procedures that are most commonly used. 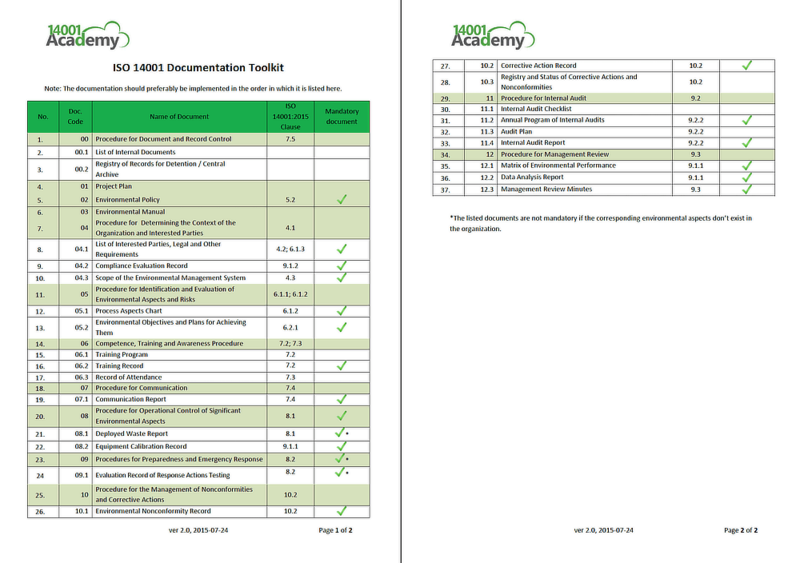 Look at EVERY template in the ISO 14001 Documentation Toolkit – for free! – before making a purchase decision. The 14001 Documentation Toolkit comes in English, Spanish, and German. Amongst other documents, it contains these ISO 14001 templates: Procedure for Document and Record Control, Environmental Policy, Environmental Objectives Targets and Programs, Procedure for Operational Control, Identification and Evaluation of Environmental Aspects, Procedures for Preparedness and Emergency Response, Procedure for Identification and Evaluation of Legal and Other Requirements, Environmental Manual, and many more – click here for a full list of ISO 14001 documents. When you purchase the Toolkit you’ll get 1 year of free access to all video tutorials. This way you will not only learn about the basics of ISO 14001, but also get a guided tour on how the documents are to be filled in. We understood your needs, found the answers to your questions, and developed ISO 14001 Toolkit especially for your company. Our toolkit doesn’t require completion of every document that a large world-wide corporation needs. Instead, it includes only those documents YOUR business needs.